Gulf of Mexico Database | Petrophysical Solutions, Inc.
Our growing Gulf of Mexico Database is another way PSI petrophysics can pay off. 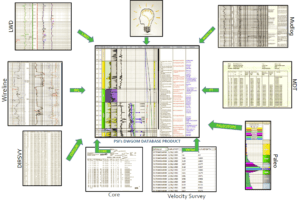 Our collection of fully interpreted data, from over 2,300 wells (to date) in the Gulf of Mexico, prevents wrong answers and promotes right answers. Using it, geoscientists can focus on their own challenges, leaving high-quality petrophysics to the database. Water saturation, total/effective porosity, shale volume included. Time and Money Saved. The key to successful use is experience – ours. Count on our know-how and databases to deliver major time-savings: Call (281) 558-6066 today.